Today’s animal wearables industry is valued in the billions of dollars. And like the human wearables industry, its history is rife with quirky innovations that successfully—if improbably—transitioned from experimental curiosities into commercial successes. These Anti-Pix chicken glasses are a case in point. Initially a home-made solution to the problem of chicken cannibalism on a private farm, they were soon refined and marketed as a poultry farm essential. 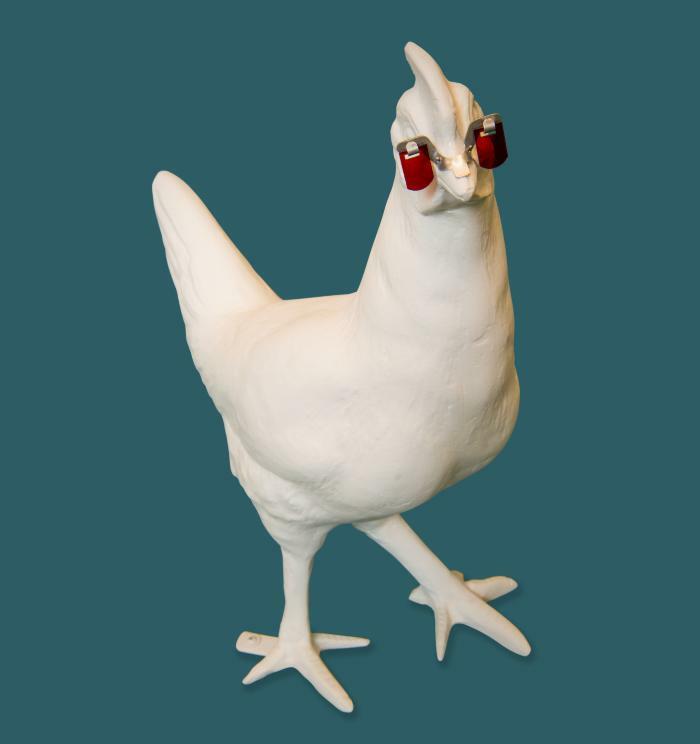 Comprised of oval, red plastic lenses joined by a single metal nose piece, these glasses produced a rose-colored tint that was said to prevent chickens from seeing blood on each other, thereby reducing the risk of cannibalistic pecking in the flock. The lenses were also affixed with hinges to the top of the frame, which permitted the lenses to swing out when the chicken lowered its head to eat. This meant the red tint would not be applied to feed on the ground, thus giving the bird an unobstructed—and presumably more appetizing—view while eating. Made in Newport, Kentucky, USA.